Here’s everything a learning guitarist will need to get into the infectious 8-bar blues form. 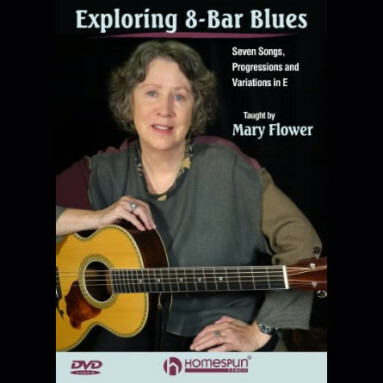 Mary Flower brings her expert musicianship to seven exciting arrangements, helping both novice and more advanced fingerstyle blues players develop important guitar skills. You will come away with a wealth of techniques, great songs and new insights into your instrument. Mary starts with simple strums and basic turnarounds for her version of How Long Blues. She gradually adds chords, progressions, licks, bass lines, picking patterns and other challenging ways to bring this and other great songs to life. Blood Red River illustrates the “stumble-thumb” right hand; Willie McTell’s Some Old Lonesome Day incorporates a cool walking bass; Big Bill Bronze’s classic Key to the Highway uses a monotonic bass and a classic bent-note lick; a variety of bass runs, turnarounds and licks enhances Skip James’ Crow Jane; the folk/blues standard Trouble in Mind brings in a jazzier chord progression; and in a big finish to the lesson, Willie McTell’s Searching the Desert For The Blues combines all the techniques in a challenging finale.